This dough is something I have been making for many years. If you have the time it’s as easy as 1, 22, 3. I use it for pizza, stromboli and garlic knots. Making your own pizza is an affordable and fun thing to do…all you knead 🙂 are a few ingredients, a big mixing bowl, and a good size board to knead & roll out your dough. But here is a secret: If you let this dough rise in a covered oiled bowl for a half hour..there is little need to roll out the dough. If you punch it down, cover it and let it rise a second time, it is sometimes even easier to work with…and you won’t need a rolling pin! Before you start, get all your ingredients together and put 2 1/2 cups flour in large mixing bowl. Next, check your water temperature..if its not warm enough the yeast won’t be activated, and if the water is too hot the yeast will be killed. That is why I use a thermometer.. 110-120 degrees F will be good. Dissolve your yeast in the water, mixing with a spoon or fork.. Add sugar, salt, oil and once combined, pour this mixture into the bowl with the flour. Now you are going to stir 22 times. This sounds strange…but trust me. Just start counting after the first few stirs, and then put your spoon or fork down and set the timer for 5 minutes. This is the doughs resting time. During this time you can also rest..just be sure to have a floured board ready so when the timer goes off you are ready to knead. Your dough should look like this…it basically looks like a not so hot mess. Soft as a babys bottom. Next you want to put your dough into a large, clean, oiled bowl, turning the dough around in the bowl so it has a very light coating of oil. 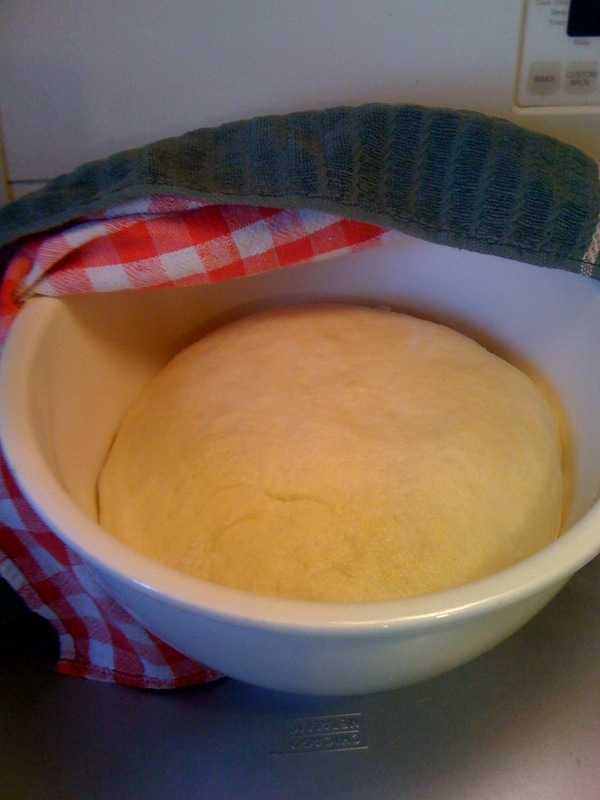 Cover with a kitchen towel, or two…and leave in a warm spot to rise at least 30-60 minutes.. Choose your toppings and drizzle top of pizza and crust with oil before baking at a high temp…I do 475 for about 20-25 minutes. I use cookie sheets, large cake pans, just about any pan will do..I will add stromboli instructions soon…its just as easy & yummy as this pizza. 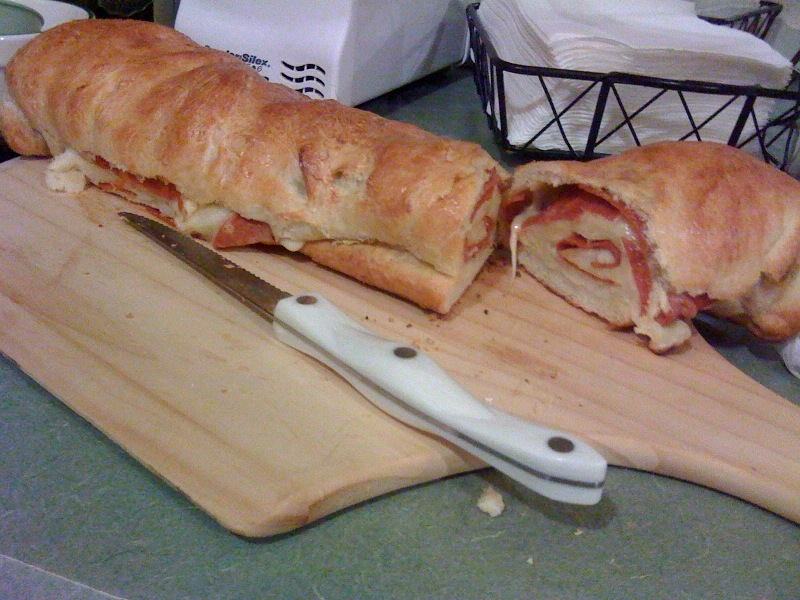 Here are some pictures of pizza and stromboli that I’ve made.. This entry was posted in Breads, Dough, Lunch or Dinner. Bookmark the permalink. Now EAT to your hearts content. I recommend the deep dish pizza!!! !